EDWARDSVILLE – Visiting Stevenson University jumped out to a 10-0 lead early in the first quarter and never looked back scoring points in all four stanzas on way to a 31-14 win over Wilkes University Saturday afternoon at Schmidt Stadium. With the loss Wilkes slips to 1-7 overall and 1-6 in league games while Stevenson remains in the hunt for a MAC title standing 7-1 overall and 6-1 in conference contests. Stevenson opened the game with a seven play, 54-yard drive capped off by a Kiandre Burrell one-yard touchdown run to take a quick 7-0 lead just three minutes in. After the teams traded punts and a Stevenson interception, the Mustangs added to their lead when Tim Sternfield's kick was good from 27 yards to pushed the advantage to 10-0 at the end of the first quarter. The Wilkes defense forced a Stevenson punt on the Mustangs first two possessions of the second quarter setting up the Colonel offense for its first scoring drive of the game. Two short completions from Ryan Dailey (Easton, PA/Wilson) to Jacob Brook (Layton, NJ/Kittatinny) of seven and nine yards took Wilkes to its own 25 yard line. Facing a second and three, Dailey dropped back to pass and found a wide openAaron Coyne (Springfield, PA/Springfield) down the right sideline as two Mustang defenders collided into each other freeing the Colonel wide out. Coyne took the pass all 75 yards for the score cutting the Stevenson lead to 10-7 following a Carl Von Glahn (Hackettstown, NJ/Hackettstown) extra point with 5:52 left in the first half. After a promising Wilkes drive stalled later in the quarter, Stevenson used a nine play, 73-yard scoring drive capped by a 39-yard touchdown pass from Brad Harmon to Devin Salisbury to take a 17-7 lead into the halftime break. Stevenson grew its lead to 31-7 to start the fourth quarter scoring once at the end of the third and once at the start of the fourth. Wilkes answered with a touchdown late in the final quarter when Dailey foundGarrett Armstrong (Hampton, NJ/Kittatinny) in the end zone after a furious scramble inside the Stevenson five yard line. The touchdown pass finished a 12 play, 76-yard drive that included a 30-yard strike from Dailey to Ryan Richards (Plainsboro, NJ/Jersey Coast Prep) on a key second down play. Wilkes had another shot to put points on the board midway through the fourth quarter, but the drive stalled and coach Trey Brown opted to try a field goal to cut the lead to two scores. The kick was blocked by Stevenson and recovered by the visitors to end the Colonel rally. Dailey finished 33-for-52 for 305 yards and two touchdowns, the seventh game the junior signal caller has thrown for over 220+ yards. He also led the ground attack rushing nine times for 49 yards. Coyne led nine Colonel receivers who caught at least one pass with six receptions for 118 yards and a score. 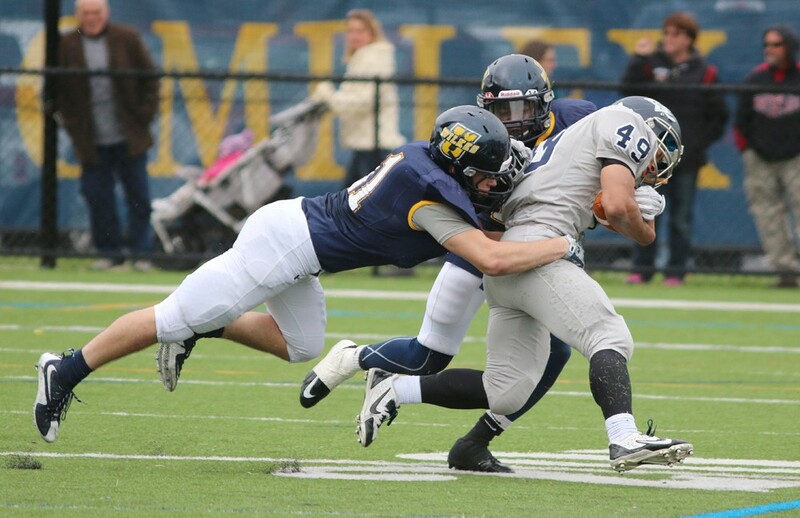 Tanner Stengel (Allentown, PA/Parkland) recorded a game-high 14 tackles while Michael Paskas(Rutherford, NJ/Rutherford) followed with nine stops and Tyheed Jackson (Horsham, PA/Hatboro Horsham) and Jason Ugwu (Collegeville, PA/Perkiomen Valley) each recorded eight tackles on the day for the Wilkes defense. Wilkes travels to local rival Misericordia University next Saturday for a MAC matchup at 1:00 p.m. in Dallas, Pa.